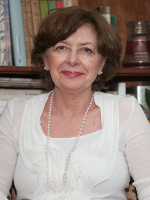 Beatriz Colombi is PhD and professor of Latin American Literature in the Faculty of Philosophy and Letters, University of Buenos Aires, Argentina. She has been guest professor and visiting researcher at universities in the United States, Brazil, Mexico and Spain; she obtained the Greenleaf Fellowship at Tulane University. Her research is focused on Latin American literary studies of the conquest, the colony and modernism, and in the areas of chronicles, archives, poetry, essays, correspondence, fiction, travel literature and intellectual networks; she has published numerous articles, books and anthologies on these topics. She has recently participated in The Cambridge History of Latin American Women’s Literature (Cambridge, 2015), and has published, in co-authorship, Cartas de Lysi. La mecenas de sor Juana Inés de la Cruz en correspondencia inédita (Iberoamericana, 2015).